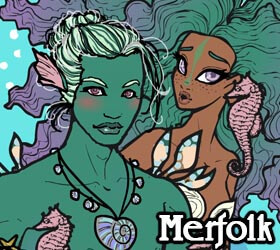 Merfolk ~ Dress Up Mermaids and Mermen! I keep clicking on the mermaid to try and edit her, lol. I'm too used to other scenemakers! @korpen-black: the game is finished now; I doubt OLa will add something more. I don't know if this has been said or not but maybe more facial hair option being added at some point? Great idea! Ehm - Okay, I know the game is ready now, and normally I don't do this, but would it be possible to add the fish-tattoo to the draggies? You know, the filigrane one. It would make a great addition and wonderful possibility for free-hand tattoos. I can understand if it's not possible, but maybe ...? I just work with two mermen and noticed that there is obviously a glitch. when you want to add the filters (white line, glowing, black and white) it works at the first merman, but not on the second, even if you remove the first one. A beautiful game, but I find it a pity that it doesn't have the glowing colours from Neptune's Daughter. It is a beautiful game though, well worthy of the wait.